Discussion in 'Isolation (ISO).' started by Switchblade_Brigade, Jul 27, 2007. 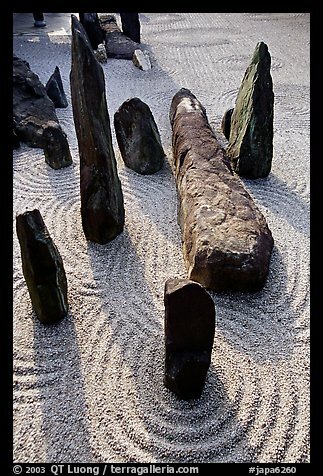 Hey, since I don't have an Iso yet I am thinking about making a zen garden (aka Japanese rock garden) themed one for my crabs. The rocks are supposed to represent mountains and the raked sand is made in patterns that represent waves. Since zen gardens were originally made for unwinding yourself and relaxing I thought that would be perfect for an iso because well, relaxing while molting etc. is the whole point of having an iso right? Here are some pics of ones I found. Oh, I almost forgot does anyone know if moss is safe for crabs? I was thinking of adding some to the rocks for a more ancient look. I like the first one. I'd like it even more in my backyard as my own ISO! Yes, moss is fine for crabs, depending on the kind. There is sphagnum moss, spanish moss, reptile moss and java moss that are safe for crabs. Also, make sure it's not coloured or treated. Soak it in boiling water or microwave it and make sure there are no little creatures! That's a good idea.Lol.It looks neat too! Definitely a thumbs up!! Great idea!! There is sphagnum moss, spanish moss, reptile moss and java moss that are safe for crabs. i thought spanish moss wasn't safe. i may be wrong though. The kind you buy in like Michael's or Walmart for example are made to look like moss but are mostly coloured pine shavings. The colouring alone can be dangerous to crabs, not to mention pine! I have a question though, it seems from the photos that that is outside, can you be sure your crabs won't come up and wander off into the wild? I is going to be in a 10 gallon tank if I can get ahold of one. I still don't follow, are you going to place a 10 gallon tank out there in the sand? I'm too sure but,I think he's going to make a smaller dupliciate (Sorry 4 spelling) & put it in a 10,gallon tank when he gets one.